I feel like I'm in a bit of a slump... I haven't written a blog post in a few weeks now and I'm still wickedly busy with life. Fulfilled mostly all of my Kickstarter rewards that people purchased... still waiting for my loving hubby to finish the ebook versions. I've submitted the book for a newer book award called the Mathical Award by Children's Book Council & MSRI (Mathematical Sciences Research Institute). I submitted my book to Costco corporate to hopefully (really everything crossed--fingers, toes, the whole bit) so they will consider carrying my book in their warehouses. Submitted The Pancake Menu to Barnes and Noble to be carried in their stores. Asked some bloggers for book reviews--let me know if you want to do a book review. 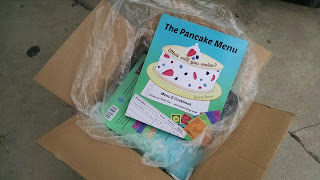 Submitted my book to Timberdoodle--a homeschooling supply site. Email homeschooling groups--I could share my friend's awesome writeup article she did for my launch. Set up school visits with local elementary schools. Call more TV stations to get some media about how fun and educational it is. I'm so excited to get my book out there, but there is only one little me in this whole big world. Do you have any ideas for me? Do you have a homeschooling group that would love the book? I'm all ears to hear your ideas for spreading the word about The Pancake Menu, a book for 7-10 year olds to have a hands-on math experience!